The Rose Apple is a tree, reaching 25 or even 40 ft (7.5-12 m) in height, and has a dense crown of slender, wide-spreading branches, often the overall width exceeding the height. The evergreen leaves are opposite, lanceolate or narrow-elliptic, tapering to a point, 4 to 9 in (10-22 cm) long, and from 1 to 2 1/2 in (2.5-6.25 cm) wide, somewhat leathery, glossy, dark-green when mature, rosy when young. The flowers are creamy-white or greenish-white, 2 to 4 in (5-10 cm) wide, consisting mostly of about 300 conspicuous stamens to 1 1/2 in (4 cm) long, a 4-lobed calyx, and 4 greenish-white, concave petals. There are usually 4 or 5 flowers together in terminal clusters. Capped with the prominent, green, tough calyx, the fruit is nearly round, oval, or slightly pear-shaped, 1 1/2 to 2 in (4-5 cm) long, with smooth, thin, pale-yellow or whitish skin, sometimes pink-blushed, covering a crisp, mealy, dry to juicy layer of yellowish flesh, sweet and resembling the scent of a rose in flavor. In the hollow center, there are 1 to 4 brown, rough-coated, medium-hard, more or less rounded seeds, 3/8 to 5/8 in (1-1.6 cm) thick, which loosen from the inner wall and rattle when the fruit is shaken. Fragments of the seedcoat may be found in the cavity. In India, the fruit is regarded as a tonic for the brain and liver. An infusion of the fruit acts as a diuretic. A sweetened preparation of the flowers is believed to reduce fever. The seeds are employed against diarrhea, dysentery and catarrh. In Nicaragua, it has been claimed that an infusion of roasted, powdered seeds is beneficial to diabetics. They say in Colombia, that the seeds have an anesthetic property. The leaf decoction is applied to sore eyes, also serves as a diuretic and expectorant and treatment for rheumatism. The juice of macerated leaves is taken as a febrifuge. Powdered leaves have been rubbed on the bodies of smallpox patients for the cooling effect. The bark contains 7-12.4% tannin. It is emetic and cathartic. The decoction is administered to relieve asthma, bronchitis and hoarseness. Cuban people believe that the root is an effective remedy for epilepsy. The seeds are said to be poisonous. An unknown amount of hydrocyanic acid has been reported in the roots, stems and leaves. An alkaloid, jambosine, has been found in the bark of the tree and of the roots, and the roots are considered poisonous. In Guatemala, the tree may be planted as a living fencepost or in hedgerows around coffee plantations. For this purpose, it is drastically pruned to promote dense growth. It grows wild abundantly, forming solid stands and thickets, in Puerto Rico, the Virgin Islands, Guatemala, Honduras and Panama. In 1849, it was announced in Bengal that the ripe fruits, with seeds removed, could be distilled 4 times to make a "rosewater" equal to the best obtained from rose petals. 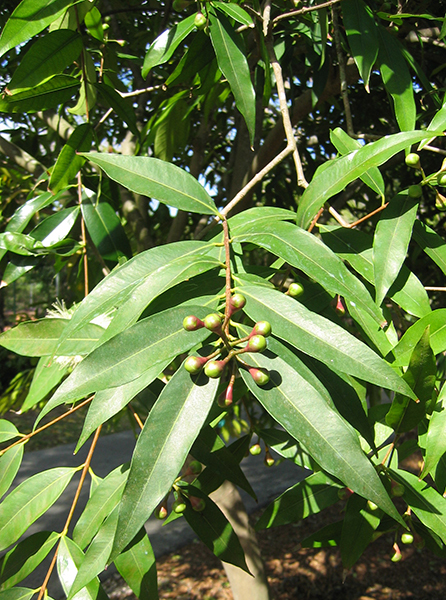 The flexible branches of Malabar Plum have been employed in Puerto Rico to make hoops for large sugar casks, and also are valued for weaving large baskets. The bark of this species has been used for tanning and yields a brown dye. The sapwood is white and the heartwood is dark-red or brown, fibrous, close-grained, medium-heavy to heavy, strong and has been used to make furniture, spokes for wheels, arms for easy chairs, knees for all kinds of boats, beams for construction, frames for musical instruments (violins, guitars, etc. ), and packing cases. It is also popular for general turnery. It is not durable in the ground and is prone to attack by drywood termites. The tree grows back rapidly after cutting to a stump and consequently yields a continuous supply of small wood for fuel. Rose Apple wood makes very good charcoal. Also, a yellow essential oil, distilled from the leaves can be use in the perfume industry. The Rose Apple is native to the East Indies and Malaya and is cultivated and naturalized in many parts of India, Ceylon and former Indochina and the Pacific Islands. It was introduced into Jamaica in 1762 and became well distributed in Bermuda, the Bahamas, the West Indies and, at low and medium elevations, from southern Mexico to Peru. Around the tropical world, Rose Apples are mostly eaten out-of-hand by children. They are seldom marketed. In the home, they are sometimes stewed with some sugar and served as dessert. Culinary experimenters have devised other modes of using the cuplike halved fruits. One stuffs them with a rice-and-meat mixture, covers them with a tomato sauce seasoned with minced garlic, and bakes them for about 20 minutes. Possible variations are limitless. The fruit is made into jam or jelly with lemon juice added, or more frequently preserved in combination with other fruits of more pronounced flavor. It is also made into a syrup for use as a sauce or to flavor cold drinks. In Jamaica, the halved or sliced fruits are candied by stewing them in very heavy sugar syrup with cinnamon. The flowers are a rich source of nectar for honeybees and the honey is a good amber color. Much comes from the San Cristobal River Valley in Cuba. The flowers of Rose Apple are a rich source of nectar for honeybees and the honey is a good amber color. In 1825, eight young trees were taken from Rio de Janeiro to Hawaii by ship, and, in 1853, a United States warship delivered Avocado and Rose Apple trees from Central America to the island of Hilo. The Rose Apple became naturalized on the islands of Kauai, Molokai, Oahu, Maui and Hawaii. In 1893, it was reported as already cultivated in Ghana. It is semi-naturalized in some areas of West Tropical Africa and on the islands of Zanzibar, Pemba and Reunion. 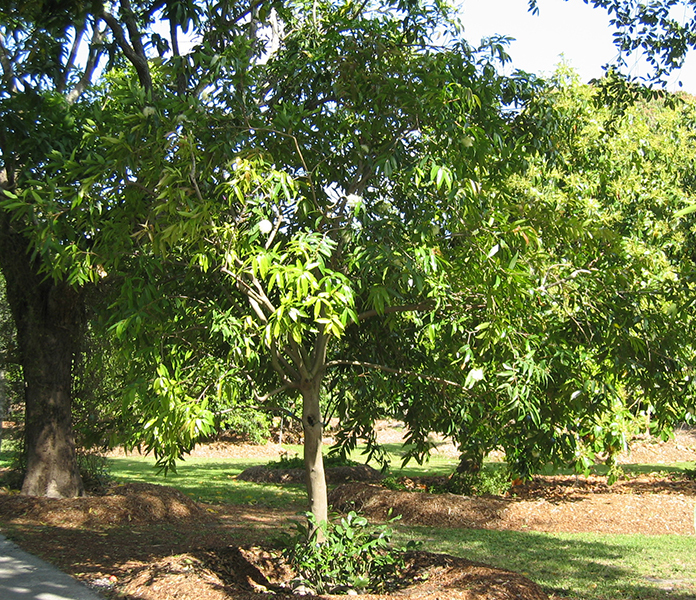 It is believed to have been first planted in Queensland, Australia, about 1896. A tree obtained from an Italian nursery has grown and borne well on the coastal plain of Israel. However, it is not of interest there as a fruit tree but rather as an ornamental. The Rose Apple was introduced into Florida, at Jacksonville, before 1877, but, as a fruit tree, it is suited only to the central and southern parts of the state. In California, it is planted as far north as San Francisco for its ornamental foliage and flowers. 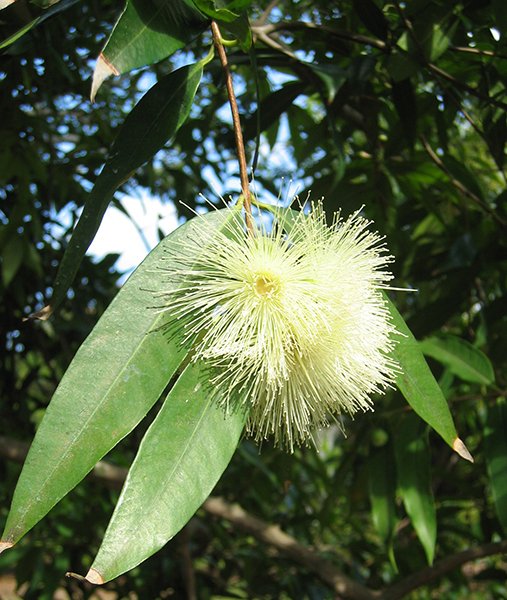 We currently have 8 herbarium specimens for Syzygium jambos in our collection. Click on any specimen below to view the herbarium sheet data.